I had a dream last night that I was in my car, about to exit the parking lot onto the street. On my right, a lady was pushing a baby carriage across the street, oblivious to the oncoming firetruck speeding toward them. Approaching from my left, the truck, equally oblivious to the mother and child in its path, was charging frantically and would not be able to avoid them even if it spotted them. Those vital seconds that followed elapsed in slow motion as my mind agonized over what to do. I could save the mother and baby only by slamming my own car into the firetruck to change its trajectory, as I'd seen done in so many movies. But the heroes in those movies never faced the brutal dilemma confronting me at that moment. In stopping the firetruck, I would be keeping it from the desperate emergency signaled by its urgent speed and wailing siren. My zealousness might very well end up condemning more lives than I would be saving. Ultimately, I could act only on what I knew for certain. I had it within my power to save two lives that would definitely be lost if I did nothing. The truck might be heading toward a burning hospital full of children, but it could just as easily be an empty doughnut shop that caught fire precisely because no one was on hand to catch it before it spread. And so I made my decision. The dream did not continue on to explore any consequences of my decision. Simply making the decision, knowing that there would be consequences, seemed to be the point. I have long insisted that it is better to know ahead of time what one will do even in the most implausible circumstances, than to find oneself caught with no idea what to do when the time comes. Yet, were I faced with that very situation in real life, I'm still not sure what I would do. The logic of my choice seems sound to me now, dream though it was, but, truthfully, I wonder if one can ever know absolutely how one will act prior to the moment itself. Such was the exchange one day at the diamond grading lab. My neighbor diagonally across from me had just returned to his desk after stepping out to answer a phone call. Leaning back in his chair, he sighed heavily and asked, "Why's it always so damn hard?" His sentiment was a common one, an understandable one, not limited to our occupation, but certainly shared nonetheless by anyone who has ever had to get through an eight hour shift one stone at a time. Nevertheless, I was not without compassion in the face of another man's anguish. While I no more possessed the answers than anyone else in that building, I figured, in lieu of hope, I could offer a bit of levity. After a pause, I responded, "Has it been longer than four hours?" Not only did he not get my joke, but he evidently hadn't even realized that I'd made one. Why, if I'd suspected that he had understood, then I would have been deeply offended by his reply. But, as I'd immediately surmised, he was referring to the fact that many employees, myself included, preferred to take lunch four hours after starting work, thereby splitting the eight hour workday evenly into two chunks. My timing and delivery were both lacking, I'm sure, but perhaps the joke was too convoluted as well. As often happens, most of the progression to that punchline had taken place in my head, through connections drawn internally, to which my co-worker obviously could not have been privy. Someone who knew me better might have been able to make those jumps with me, but this guy was not exactly my buddy, and, so, in trying to reach for just a little more than the standard "That's what she said," I had instead come up with a seeming non sequitur. Nor did it seem appropriate to explain after the fact. And so my witticism went unacknowledged, lost in the ether, or so I thought, until it occurred to me to post about it here. Geico recently rolled out a new set of TV spots in their "cavemen" series of commercials. One of them features a caveman inexplicably facing female tennis legend Billie Jean King in a match. Oblivious to his own poor performance, he is directed toward the scoreboard, at which point he spots a Geico banner and promptly packs it in, apparently feeling he was made the unwitting stooge in a gag of poor humor. The other ads are similarly-composed: the cavemen, initially enthusiastic about some activity, are surprised by the appearance of a Geico logo, and, unamused, they abruptly decide to walk away rather than play further into some perceived joke at their expense. Frankly, I just don't get it. The original commercials were based around the premise that the Geico slogan, "So easy a caveman could do it," was insensitive to cavemen, who actually still existed and had mostly adapted to modern society, their one persistent obstacle being the mainstream stereotypes that Geico was helping to perpetuate by suggesting that they were primitives of low intelligence. The scope of the ads then quickly extended beyond the slogan issue, depicting frustrated cavemen trying to go about their lives while facing preconceptions from a variety of sources. I was not particularly a fan of the original commercials. If anything, the recent motorcycle ad, featuring the music of The Sounds, is the funniest one yet. My problem with the new commercials is that they set the focus back on the "Geico offends cavemen" situation without in any way explaining the original concept from so long ago. The joke is impossible to understand for anyone unfamiliar with the original series. At the same time, if you do remember the old commercials, you might, like me, be confused by the seeming discontinuity. One of the earliest commercials had a Geico PR rep earnestly apologizing to the cavemen over dinner, which should presumably have brought an end to the "So easy" campaign. So why, years later, have the insensitive billboards suddenly returned? And, that being the case, why do the cavemen seem so submissive now? Did I maybe miss an installment, where perhaps the cavemen were persuaded to whore their image out to Geico, now to their impotent regret? I'm being silly, I know. But that goddamned Billie Jean King commercial... I just don't get it! Yesterday, the bigwigs at work gathered us all together for an impromptu meeting. By "impromptu," I mean that none of us in the general populace were notified prior to the happening. The manager and supervisors holding the meeting seemed to have rehearsed it a couple times already. The main thrust of the meeting was apparently to remind us that "we must not take our jobs for granted" in today's economy. The higher-ups were including themselves in that "we," yet they shifted to second person as they stressed again and again that "you never know what could happen." The words "volatile" and "situation" were repeated multiple times, with nothing more concrete offered. The manager closed by pointing out that the company has been through worse. "Just ask Steve (one of our supervisors) about the '80s," she said, through her brutally humorless Chinese accent. "Even he was laid off." Nobody did ask Steve about the '80s, however, and he just stood there smiling uncomfortably. I wasn't sure what such a vaguely ominous address to everybody in the building was meant to accomplish, besides inciting the muted panic that ensued once we were sent back to work. Today, for some unspecified reason, we were all treated to free cake and ice cream. I especially enjoyed the ice cream-filled cupcakes, ice cream cake being ever one of life's highlights, which I never take for granted. Was it so excellent that I would trade my income for another? No, of course not. Don't be absurd. Let me be clear that "dessert day" is not a weekly, monthly, or even annual tradition. Yet not one of the proletarians who was so rattled the day before seemed to draw any connection between that event and today's unannounced celebration of nothing in particular. Perhaps the truth was too awful to admit. Or perhaps they had already made peace with their fates and were trying just to enjoy the moment. About fifteen minutes into my hour-long commute home, I heard my cellphone ring. So this was how they were handling it, I thought to myself. Give us one last, happy memory to go out on, then dismiss us impersonally over the phone. Well-played. Bastards. I couldn't answer while driving, but, as it turned out, I didn't recognize the number or even the area code. Whoever had called didn't feel it worth leaving a message. False alarm, I suppose. Hopefully, when I get into work tomorrow, there will still be some ice cream left over. The cover is Animal Crossing: City Folk for the Wii, but, as far as I'm concerned, the feature story is Suikoden: Tierkreis for the DS. The Suikoden series remains a favorite of mine on the strength of the first three titles, but I don't think any game franchise has suffered as drastically from the departure of a single man from the development team. In Suikoden's case, that man was series creator Yoshitaka Murayama, who left Konami under shady circumstances near the end of Suikoden III's development. The post-Murayama titles have been decent, but "decent" is a far cry from the heights reached by the first three titles. Based on this month's preview, Tierkreis sounds like a desperate attempt to restore the series to relevance in a JRPG pool overflowing with indistinguishably banal titles. Apparently looking to make a fresh start, this latest installment is set around parallel worlds and will not be reusing any previous characters or locations, effectively discarding five titles' (and multiple side stories') worth of painstakingly-crafted history and geography. With Murayama gone, it was unlikely that we would ever have gotten real resolutions to the lingering threads established in the first three games anyway--hence, I suspect, why IV and V were both prequels--but the attention to continuity was nonetheless a trademark of the series and one of its most appealing aspects. With the original creator gone and his mythology now left behind, I'm not sure how much this leaves to tie Tierkreis to the titles that I loved, but I remain optimistic that it can be a quality game in its own right, one which hopefully will retain at least the spirit and sophistication of the earlier installments. Besides, the "parallel worlds" concept still leaves room for it to somehow work its way into the old continuity. In any case, I'll be there to buy the game as soon as it releases, at which point it will shift to the top of my play pile. I found the Clone Wars theatrical feature to be surprisingly enjoyable. While the animation could not possibly compete on a technical level with legitimate theatrical productions, the film combined a clean and consistent look with some impressive stunts that were in keeping with the distinctive Star Wars aesthetic of lightsabers and Force-powered acrobatics. Of particular note, the first act provided an exciting new look at ground combat in a world of Jedi and droids. True, the unrelenting action had become exhausting by the third act, whereupon it took some questionable turns, but, overall, it was a good sight better than the reviews would have suggested. Four episodes in, the television series is more of the same. The first episode, a Yoda-centric story, was fairly worthless, and I personally find Yoda intolerable in anything but the smallest doses. The three-episode "Malevolence" arc, however, made good use of the show's short running time and weekly format to provide tightly-focused stories that tied together but were probably best digested with breaks in between. More than anything, the show reminds me of the action cartoons that I watched as a kid--programs like G.I. Joe and Transformers, which were so characteristic of television animation from the '80s through the early '90s. I haven't actually seen any of those shows again since watching them as a young child, so I hesitate to defend their quality too fervently based on vague rose-tinted memories, but, while such mercenary productions might make for suspect models, I have often found myself yearning for a return to those times in the face of today's distressingly irreverent and, in my opinion, equally unambitious kids' programming. Even as they were motivated by the overriding mandate to peddle toys to their young viewers, they managed to provide stories of heroism and virtue in a wink-free manner scarcely found among cartoons these days. I can't say I go the whole week looking forward to the next episode, but, when it does arrive, it provides an expectedly breezy half-hour of mild thrills that takes me back to my childhood. As I've suggested previously, I hold the Resident Evil series in high regard, ranking it probably among my top three gaming franchises. The series has certainly had low points, however, such as the Survivor light gun games or the mediocre Outbreak online titles. Most fans ignore these side stories as irrelevant to the main canon, and I personally have never felt compelled to play them. Resident Evil: The Umbrella Chronicles for the Wii is an unusual case, as the on-rails experience is far removed from either the survival horror of the earlier titles or the third-person shooter action of Resident Evil 4, yet it's still generally regarded as one of the main installments due to its use of characters from the core series, as well as some important new contributions it makes to the plot. Released after RE4, Umbrella Chronicles retells the events of Resident Evil Zero, Resident Evil, and Resident Evil 3: Nemesis. A fourth chapter contains brand new material that fills in some of that massive gap between Resident Evil: Code Veronica and RE4, specifically covering the fall of the Umbrella Corporation, which had been glossed over anticlimactically in the opening text of RE4. Umbrella Chronicles consequently serves both to fill in new fans introduced to the series via RE4, as well as to tie things together for longtime fans trying to make sense of things. In practice, the handling of the stories from the older installments is mostly disappointing. While the series has never been too heavy on plot, Umbrella Chronicles distills things even further, with each chapter being strictly a straightforward zombie-filled shooting spree leading up to each game's final showdown followed by its ending. Events and subplots are excised, and major characters like Barry Burton and Nicholai are completely removed without any explanation. Even as a highlight reel, it's somewhat unsatisfying, as the on-rails format cannot capture the carefully-engineered tension so crucial to the original experiences, meaning that many of the games' most memorable moments are not represented. Likewise, in terms of gameplay, the survival horror genre simply does not translate to one-dimensional on-rails shooting. Puzzles are out of the question, inventory management can mostly be neglected, and flight is never an option. Even RE3's signature gimmick, the STARS-stalking Nemesis, is reduced to just another boss to be brought down through the usual hail of gunfire. As for the new chapter set between Code Veronica and RE4, it's arguably the most disappointing of all, as it is just as straightforward and lacking in explanations as the recap episodes, resulting in a finale that is still anticlimactic. It doesn't help that neither Code Veronica nor RE4 are ever actually referenced, leaving some significant gaps on both sides of the timeline. The best parts of the game are actually the side missions that become unlocked as the player progresses through the main scenarios. Set both alongside and between the primary chapters, these missions revolve around supporting characters in previously unseen events that fill in some of the holes in the series. Most of the new story material of the game, including the true ending, actually comes from these stages, as one character's recurrent subplot weaves revelations into the story that help to set up the fourth act. While it may fall short of its promise, the game does actually have a lot to offer. The playable content, comprising four main chapters of three stages each, along with ten side missions, is quite substantial, unusually so for the genre. There is also a fair amount of fanservice, including tons of collectible reference material to cover all the plot and character information that the playthrough itself omits. And series fans will surely appreciate the many trophies in the forms of assorted objects from throughout the franchise's history. The production values are quite high for what the game is. The GameCube installments were some of the most visually-attractive titles of their generation, and Umbrella Chronicles reuses many of those assets to good effect. The game looks and sounds like a real Resident Evil product, with none of the distracting inconsistency or cheapness of the various side stories. In essence, it's comparable to the Indiana Jones Adventure ride at Disneyland; it's an enjoyable enough experience that captures the aesthetic of the source material, but it cannot be taken as a replacement for the original works. And, taken on its own merits, well, it's a lot of fun, as on-rails shooters tend to be despite their lack of depth. When the Wii was first unveiled, one of my hopes was actually that it would mean a return of the light gun genre, as having a pointing controller standard meant that the visceral joy of firing a gun could be viably retained without the burden of an expensive peripheral that would be useless with 99.9% of games. In practice, I now realize that motion controls could never truly replace the light gun. While more tactile than a control pad, it's functionally not too far off. You're still just manipulating an onscreen reticle, rather than legitimately aiming. Nevertheless, feel goes a long way, and it's still more satisfying than a D-pad or analog stick could ever be. Cooperative play, certainly the preferred mode in any on-rails shooter, is a blast here as well, albeit the difficulty doesn't seem entirely balanced for it, with boss fights in particular stripped of all challenge. The exception to this is in the quick time events that occur periodically RE4-style. I personally have no problem with QTEs as a gameplay mechanism when used sparingly, but I must admit that they were the source of my greatest frustrations in RE4--probably 90% of my deaths came during the knife fight (most of the rest were in that blasted jet ski scene!). In co-op Umbrella Chronicles, each player is randomly assigned a different button press/combination or waggle motion for each QTE, which they must both input correctly and in time. As in RE4, one QTE late in the game features an homage to the infamous laser corridor from the Milla Jovovich films. This ridiculously-staged and entirely gratuitous sequence proved absolutely maddening during my co-op playthrough, as the timing demanded was so tight as to practically require lucky guessing in order to avoid the instant death that would result from either player's failure, with the last checkpoint being a ways back. That absurd moment aside, it's also unfortunate that the side missions are initially single-player only, with co-op only being unlocked after all stages are beaten. Regarding the game's single greatest disappointment, the omissions of Resident Evil 2 and Resident Evil: Code Veronica, the official word is that their stories do not figure into the main Umbrella arc. This sounds completely bogus to me, as RE2 takes place around the very same event as RE3, while Code Veronica was the game that really established Wesker as a potential "franchise player." A more likely explanation is that the project just lacked the time and budget to cover everything, so they cut the parts which had the fewest GameCube assets available for reuse. Personally, I like to believe that it's because RE2 and Code Veronica were the Claire Redfield titles. Of the four main characters of the series, Claire is the only one who never received a GameCube makeover. Perhaps Capcom decided it would be a waste to have her rendered in Wii graphics for her current-gen debut. 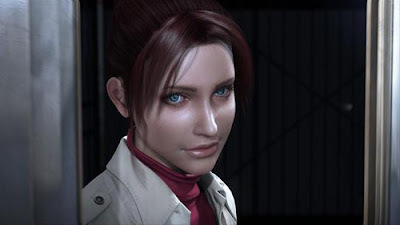 Instead, it looks like the Resident Evil: Degeneration movie will be the first appearance of the new Claire, albeit the production values sadly do not look on par with the real-time graphics of the upcoming Resident Evil 5. The release of the highly-anticipated PS3 title, LittleBigPlanet, has been delayed a week in light of the discovery that a licensed song used in the game contains lyrics referencing the Qur'an. I can well imagine that there are no members of the LittleBigPlanet team familiar enough with the Qur'an to have caught this during development. I suppose the lesson is that, if at any point the lyrics in a song become incomprehensible, it might be a good idea to look them up, on the off chance that the words actually mean something. While one week is inconsequential to me, I have to believe that a delay this close to release is an expensive hassle for Sony. This has been making the rounds on the Internet for a while now, but if you're not familiar with it, check out the video before reading further. Remarkable stuff, no? A scrutinizing eye will spot imperfections (eyes are glassy, lips too soft), but, at some point, I have to question whether the tells I'm spotting are actually there, or if it's just the power of suggestion causing me to see things. The point is, were I just casually watching the computer-generated Emily in the mundane context of a daytime soap opera, I would very likely be fooled. As far as gaming is concerned, an obvious application would be for sports games. Gone would be the inadequate and inconsistent likenesses of today, replaced by the players' real faces, leading at last to that long-sought dream of having a random passerby mistaking a game of NBA Live for a live NBA game, pausing to ask in earnest, "Why does Shaq keep jacking up threes?" Movie-based titles, meanwhile, could exactly employ the faces of actors, having them star as never before in interactive sequences nearly indistinguishable from the films they are adapted from. But, honestly, who cares about all that? In the end, sports games would still be sports games, and license-based games would still be garbage. What does any of this mean for real games? Could, say, Rhona Mitra's face be pasted onto the CG body of Lara Croft in a future Tomb Raider title? Based on the Emily video, it won't long be a matter of "could." The question is whether or not such a thing is desirable. Through three generations, Lara Croft's design has undergone significant evolutions in a trend toward more realistic features and proportions, but I wonder whether, apart from any technological concerns, there aren't limits as to just how real she can become. Despite extensive reworkings, she has remained always identifiable by her exaggerated eyes and lips, distinguishing features that have kept her more recognizable from title to title than James Bond is from actor to actor. Is there any live human being who could match the character's look so faithfully as to own the role of the real Lara Croft, "real" in this case referring ironically to the one in the video games? Is that even the goal? What, in other words, is the ideal form of Lara Croft that the Tomb Raider artists are reaching toward in their continuous refinements of the character's design? Does a photorealistic human woman lie at the end of that rainbow? Or is she basically a cartoon character, the same as Mario and Donkey Kong, who have seemingly already arrived at their final forms? I do not use "cartoon" in a derogatory manner, as good cartoon characters achieve life convincingly through designs and animations full of personality, causing us to believe in them, sometimes even more so than live action actors, regardless of how exactly they physically resemble us. Photorealistic characters remain as yet unachievable, so the question has been moot. But, in the face of Emily, technology is now close enough that these matters must be considered. There's a rumor floating around that Marvel vs. Capcom 2 might be making its way to both PS3 and Xbox 360. If true, this is huge. First released in 2000 to arcades and the Dreamcast, the classic 2-D fighter has been extremely hard to find for years now. A legitimate "like new" copy for the long dead Dreamcast now typically goes for twenty dollars over original retail. The PS2 and Xbox versions are even rarer, as they were released in incredibly limited supply, most likely due to Marvel's exorbitant licensing fees. These same licensing issues had made it appear unlikely that it would ever see another release on console. Perhaps Marvel has had a change of heart in the face of the utter shamelessness that is Mortal Kombat vs. DC Universe. (An idea so crazy that it just might work! Oh wait, it already did. Twelve years ago. Back when that other iconic fighting series teamed with that other superhero universe.) Whatever the case, I'm very much hoping that this rumor is true, despite the fact that I already own both the Dreamcast and PS2 versions. When I was a game tester, one of my favorite parts of the job was the fighting game sessions during breaks. Street Fighter III: 3rd Strike was the popular title for most of my time there, but there was a period when everybody was playing Marvel vs. Capcom 2. There were two players with substantial arcade experience, whom I absolutely could not beat, but they rarely participated. Over the rest of the building, I probably held a 9:1 advantage or better. No, I wasn't at all good at the game. In lieu of skill, I counted on the basic principle that the average player had no idea how to cope with Captain Commando flying off the sidelines and pounding the ground every second. Essentially, I was thrashing weak players by pressing just one button repeatedly to summon my assist character over and over again. Having Cable as my point character was little more than a bluff. One day, a new guy showed up and started impressing people with his flashy Magneto combos, which I could appreciate better than most of the spectators. While nitwits were still deluding themselves into thinking Spider-Man could compete, I knew enough about the game to know that, in the right hands, Magneto was one of the most dangerous characters. I had believed him, however, to be unplayable on a control pad, yet this guy was pulling combos off at will. After he had built up a streak of three victories, my turn came up. I picked my usual team of Cable, Captain Commando, and a random third. I proceeded with my strategy of pretending like I could use Cable, while actually relying on Captain Commando to nail them. The result? I swept his Magneto/Storm/Psylocke team and never once got hit with a Magneto combo. Evidently, this guy's game was just for exhibitions and fools. He had clearly put a lot of time into practicing his combos, but it didn't matter, because he had no idea how real matches played out. Incredulous, the next break, he had the nerve to challenge me to face his friend, also a Magneto player, who was supposedly much better. Sure enough, his friend was better. But the result was the same. Thus, I managed to beat two far more technically skilled players through savvy and the most basic "strategy" in the game. Can't wait to do the same thing online. I used to play the original Kirby Super Star on the SNES all the time. The "Gourmet Race" game became a particular obsession. I'm pretty sure I had the first course perfected, and that meant more to me than any of my times on actual racing titles like F-Zero or Super Mario Kart. Playing the new Gourmet Race on the DS, with added multiplayer versus functionality, I had a rude awakening to how times truly have changed. I got smoked. Badly. And not even just by the other player. On the second course, I actually finished third, even behind the CPU King Dedede. Part of this I blame on the controls. B is attack, while Y and A are jump. I can't recall if the SNES version worked the same way, but this feels completely counterintuitive. Really, B should have been jump, and Y should have been attack. Setting aside my personal woes, I'll say that the Kirby games have always been criminally underappreciated. With its signature blend of platforming and action, and sporting one of gaming's most versatile action heroes in its irresistable star, the series has proven itself to be consistently high-quality. The cooperative functionality of the 16-bit titles elevated them even further in my esteem. The original Kirby Super Star was arguably the finest installment. Mechanically, it was one of the most sophisticated action-platformers of its generation, with most of Kirby's copy forms having multiple abilities that added depth and variety. The Fighter form, for example, gave Kirby a mix of close-range attacks that practically turned the game into a beat 'em up in the style of Double Dragon. There are even signs--the guard mechanism and the basic physics and feel of the combat--that, out of all of creator Masahiro Sakurai's titles, Kirby Super Star specifically laid the groundwork for his Super Smash Bros. games. Brawl's "Subspace Emissary" mode feels like a particularly purposeful return to (the vastly more playable) "The Great Cave Offensive" from Kirby Super Star. And Brawl's Boss Battle mode is nearly identical to Kirby Super Star's Arena. As far as the DS port is concerned, it feels much the same. My aforementioned difficulties were surely due to the fact that my skills have not aged gracefully. New movie sequences and a couple of extra multiplayer minigames enhance the still solid experience, and it's nice to see the original co-op appear fully intact. The cover story is Resident Evil 5, though the only noteworthy part is the reveal of the previously alluded to "Gears-style" controls. Much to my relief, there is still no moving while shooting. Rather, an optional new control scheme allows for strafing as an alternative to the traditional tank controls. This will certainly disappoint some, but I personally never agreed with the sentiment that run-and-gun functionality constituted a necessary or even significant "evolution" of the Resident Evil 4 design. At no point in RE4 did I ever feel the need to move while shooting. The gameplay was very carefully balanced according to the confines of its specific control scheme, so that the player's options were always sufficient to deal with any situations faced, while any more mobility would have placed the enemies at too severe a disadvantage. I have no doubt that RE5 will be just as meticulously designed. The controls controversy strikes me as an intriguing reflection of one of the fundamental differences between the Western and Japanese gaming philosophies, not just among designers, but also the players. English-language reviews, I've noticed, often emphasize aspects such as freedom and linearity, usually expressing disappointment when gameplay is too inflexible or progression too clearly scripted. This has frustrated me in the past, as the titles that got me into gaming, nearly all of them Japanese in origin, were based on straightforward mechanics and almost entirely linear structures, and my current tastes remain largely the same. The Resident Evil titles are about as scripted as games come, and I have long maintained that they better represent gaming as an art form than almost anything else out there. Within the gaming community, however, I can think of few titles that inspire as much debate over whether the elements of design are good or bad. The earlier installments, in particular, engage the audience in a very deliberate manner, restricting camera and controls, among assorted other tricks, to evoke feelings of tension, panic, and serenity on cue over the course of a series of fixed events. These same elements have become a major point of contention over the years, with many players claiming that the awkward mechanics needlessly hinder the experience, while the forced linearity inhibits the impulse to explore. In my opinion, these things are the experience, and anyone asking to have them "fixed" is better off playing a different game entirely, as that's essentially what they're asking for. The original argument--"Gears-style" controls versus stop-and-shoot--amounts to the same thing: players are asking to play the game, not the way it works as intended, but, rather, however they feel like. In essence, players of Western games prefer to impose their feelings on a game, rather than have their thoughts and emotions steered by it, something that Japanese games often demand. While the latter sounds more passive and, consequently, anti-game, I see the value in a methodically-directed game that has convictions of its own. With a game like Grand Theft Auto III, a player might relate his unique story of how, on one occasion, he was able to hold out indefinitely against the full might of the U.S. Army. War stories of this sort can make for eye-opening anecdotes, as, thanks to the open-ended nature of the game, players may have differing experiences despite playing the same title. Among Resident Evil fans, meanwhile, a player need only say the words "interrogation room" to elicit the shared memory of a particular moment from Resident Evil 2. In this case, the discussion becomes more about the developer's craft in staging the scene than the player's manipulation of a given set of pieces. The designer is assessed as an artist rather than a toymaker. I'm generalizing, to be sure, as no game is entirely one way or the other, and a good number, both Western and Japanese, are close to the middle. Nor do I mean to say necessarily that one approach is better than another. While my own preference is probably clear, it is merely a preference, and, more than anything, I appreciate having a variety of different games to choose from. The only other story of interest this month is an article discussing the recent trend toward including cooperative play in major titles, including RE5. Co-op largely disappeared once gaming went 3D, as ambitious camerawork inherently restricted the ability to effectively contain multiple players on one screen, split screen being a less than ideal compromise that often wasn't feasible given technical limitations. As the article suggests, more sophisticated storylines further made it difficult to integrate a believable role for a second player character into the same story as the single-player campaign. This generation, with online play, the camera and performance issues are theoretically eliminated, while games like RE5 and Left 4 Dead feature narratives designed from the outset with multiple player characters in mind, using AI-controlled allies to fill roles as necessary in lieu of extra players. The return of co-op is certainly good news to me, as the workaday life sometimes makes it hard to find the time or motivation to play more involved single-player games, yet I'm always up for a good multiplayer experience. With regard to RE5 specifically, however, I am somewhat ambivalent. The Resident Evil series is one very near to my heart, and the all-consuming immersion of the games has fostered an illusion of intimacy over time, as my many solitary moments spent in that universe have felt almost like a real part of my life. Having another guy there might feel like an invasion of that very personal space. A cooperative session would be a great way to share my enthusiasm after I'm already familiar with the game, but, for a first playthrough, I honestly think I'd prefer to experience it alone. When I went to Anime Expo this past summer, more so than any events or panels, the real attraction was the cosplay. I don't exactly go to a lot of these conventions, so it was pretty shocking to find myself surrounded by so many fans unabashedly dressed as their favorite fictional characters, many of which were far too obscure for me to identify. While I had never considered dressing up prior to arriving, the intoxicating atmosphere soon had me convinced that the cosplaying lifestyle was a wonderful thing. I'd be lying if I said I didn't feel a tad envious even, as I observed my costumed companions repeatedly receiving compliments and requests for photographs (for outfits that were honestly pretty simply assembled). Without actually having committed to any other conventions, I had already begun to wrack my mind over what costumes I could make for myself for next time. As I got to imagining myself dressed up as various characters, however, feelings of revulsion came over me. For reasons not entirely clear to me, the idea of taking on the persona of another individual, whether real or fictional, is more than I can deal with. I could say that the cosplay thing is just not me. But isn't that the entire point? Halloween is coming up soon, and I'm not sure what to do. A more generic outfit--a broad concept instead of a specific individual--might be more workable, but I'm not entirely comfortable even with that. Perhaps I'm just too attached to my own persona. Since the recent price drop, I've been seriously considering picking up an Xbox 360. That probably sounds insane, coming on the heels of my last post, and especially in these penny-pinching times. Furthermore, after a little research, I've found that the $200 price tag of the Xbox 360 Arcade is extremely deceptive. The bundle does not include a hard drive, and the Xbox 360 takes a proprietary design, so no random hard drive will do. Sold separately, the 120GB HDD retails for an inflated price of $160. At a total now of $360, this is actually cheaper than the high-end Xbox 360 Elite model, which has the 120GB HDD built in and retails for $400, the same price as the cheapest PS3 model. That $360 price is still a lie, however, as this setup is missing crucial features that must be purchased separately. No Xbox 360 model comes with wi-fi built in, a ridiculous omission, considering that all the other current-gen consoles and even the handhelds have this feature by default. Instead, Microsoft would rather sell users a $100 dongle as their only supported solution (there are ghetto workarounds for cheaper). Add in an annual $50 Xbox Live fee for online play--another feature that comes free on other platforms--and the total price now stands at $510, which is more than the most expensive PS3 model. If the 120GB HDD is too extravagant, there is the Xbox 360 with 60GB HDD option, which brings the total price down to $470, which is cheaper but still in the same basic range (i.e. luxury). Taking away the many question marks, that doesn't leave much. The two Mistwalker titles have received mediocre reviews, and I'm not sure how many more traditional JRPGs I can play anyway. Gears of War is the lone A-list property, and, while I'm intrigued, I've never played it and wouldn't gamble $500 on the chance of my liking it. Overall, the list doesn't stack up favorably against the PS3's potential trump cards in Little Big Planet, Heavy Rain, God of War III, and the eventual next Team ICO project. Really, the one thing making my decision difficult is my desire to play Earth Defense Force 2017, a budget title from Sandlot, the developer of Robot Alchemic Drive, probably my favorite game of the last generation. So, yes, Devil May Cry 4 was a very fine game, which I enjoyed quite a bit. That said, I don't expect that I'll be playing it again in the near future, and certainly not six times through. This is not because it is a lesser title than its predecessors. Rather, my collection of unopened video games has grown too large. I won't report any numbers here, as the reality would surely shock and disgust anyone reading, but, sufficed to say, it's a lot. At the same time, as may be evident from trends in my previous gaming-related posts, my aptitude for playing games seems to have decreased, and I can no longer burn through one after another. Although my passion has not diminished, with both my time and energy being so much more limited, and with such a huge backlog of titles to get through, I can't spend those extra hours savoring one specific game. I'm leaning toward Killer7, as I've heard that it's short and has limited gameplay, which, these days, sounds right up my alley. I completed the original Devil May Cry twice and actually played through Devil May Cry 3 six times (twice on the original release, four times on the Greatest Hits special edition). As for Devil May Cry 2, I played through Dante's story, then gave up early in Lucia's side, because the gameplay was just too horrible. So it would seem that the series has had a checkered history, but with definitely more good than bad, DMC1 and DMC3 both being among my favorite PS2 games. In fact, to make things simpler, if at any point I refer to "previous installments" in a remotely flattering context, let it be understood that I mean DMC1 and DMC3 (and DMC3:SE). So, how does DMC4 stack up? After finishing it yesterday, I would say it is a worthy addition indeed. Leading up to the game's release, much was made of Capcom's decision to replace Dante as the lead with a new character named Nero, drawing immediate comparisons to the unpopular Raiden situation in Metal Gear Solid 2: Sons of Liberty. Although Capcom mitigated the backlash by publicizing this move far in advance rather than deliberately deceiving players, fans still felt understandably attached to Dante as the franchise's main man. To a small extent, the MGS2 comparison is justified, as the game's story clearly means to contrast the brash, young Nero with the unflappable Dante, who actually seems cooler than ever as a result, making fans that much more eager to play as him instead. In gameplay terms, however, I found Nero to be more than Dante's equal. While he has only one sword and one handgun, versus the many melee and ranged weapons that Dante has always had, Nero comes with two brand new mechanisms. The less significant of the two is the "Exceed" system, which allows Nero to charge up his sword to perform flashier, more powerful attacks. In practice, use of it is not at all necessary to succeed, and it's actually kind of tricky to find opportunities for charging the sword, but, at expert levels, it can make for extremely stylish combos. The real key to Nero's game is his demonic right arm, the "Devil Bringer," probably the most significant addition ever to the franchise's now familiar combat dynamic. It's not a revolution, but it does add a legitimate third element to the signature sword+guns gameplay, allowing for more elaborate combos than ever before. You can knock the enemy away with the sword, shoot them before reeling them back in with the Devil Bringer, perform a ground combo leading into a rising slash to lift them airborne, follow with a midair sword combo, toss them back to the ground, shoot them several times during your own descent, then finish finally by crashing down on them with the sword. This honestly never gets old. The Devil Bringer's awesomeness shines through even more so against bosses, as using it triggers a spectacular enemy-specific mini-cutscene. Despite it being non-interactive, I can think of few moments in gaming more viscerally-satisfying than watching Nero unleash a vicious combination of body blows against the evil pope. Outside of combat, the Devil Bringer also adds a bit to platforming via the inclusion of some preset Bionic Commando-style grappling sections. While not a major part of the game, they are preferable to the clumsy bits of jump-based platforming that have always been a minor irritation in the series. When the game eventually does switch over to Dante's perspective, it feels like a step back, despite the fact that Dante himself has more options than before. While he has fewer weapons overall than in DMC3, he now has access to all of them at all times and can even switch on-the-fly between his four fighting styles. This gives him about four times the number of moves that Nero has, but he has no equivalent to the Devil Bringer. With no way to reel enemies in, Dante has to waste a lot of time chasing guys down. Boss fights are also far less dramatic without the spontaneous mid-fight cutscenes. In essence, playing with Dante feels just the same as in previous installments, which isn't a bad thing. But Nero's game is an actual evolution that represents the direction the series ought to be taking. One of the things the series has been known for is its high degree of difficulty, which has at times limited its audience. DMC3, in particular, was notorious for being insanely difficult even on easy mode, though DMC1 is just as hard, in my opinion. DMC4, on the other hand, is a much more approachable affair, more along the lines of DMC3:SE, whose generous continue system (free continues at checkpoints, with consumable Gold Orbs acting as extra lives) it retains. "Human" mode (i.e. easy difficulty) is a very leisurely experience, while "Devil Hunter" (i.e. normal) is challenging but never unfair. Enemy variety is much improved over DMC3, with foes being a good mix of that game's glorified sandbags and some actual threats that require more thoughtful approaches, though there is nothing so dangerous as the exploding dogs of DMC1. The bosses, always a highlight of the series, are typical but well-crafted designs that are nowhere near as unforgiving as in DMC3, and the free continues help to relieve any frustration from dying. Story has never been the focus of the series, but I'll mention that it is well-paced and unobtrusive, and, like previous installments, it's actually more compelling than it gets credit for, thanks to a charismatic cast backed by strong performances. Boasting high production values and still by far the deepest, most gratifying combo system in the genre, DMC4 proves to be an extremely solid title with few peers in its field. It's by no means an innovative title, but the action is as addictive as ever and, for new fans, it's the most accessible installment yet. Another game I've been playing sporadically for well over a year now, the Nintendo DS remake of Final Fantasy III often feels like a lost classic from the franchise's golden age, before Hironobu Sakaguchi lost his mind and thought he could make movies, before the self-indulgent excesses of Tetsuya Nomura, and long before an infirm Yasumi Matsuno fumbled the company's biggest project into the hands of its resident lunatic, Akitoshi Kawazu. Unfortunately, this would also have been just before the actual prime of the series, as the dated gameplay and storytelling mark it as a title much closer in spirit to Final Fantasy I than to Final Fantasy IV. The remake practically ignores the DS-specific features of the dual screens and touch control, eschewing innovation in favor of a faithfully traditional experience. This is not a big deal as I'm personally opposed to gratuitous implementation of DS gadgetry in games that clearly aren't designed with them in mind (which FFIII obviously wasn't). On that note, the 3D graphical overhaul doesn't add very much in terms of functionality or gameplay. In fact, it mainly adds a really annoying new gimmick where the player can zoom in and out to reveal hidden items and switches. The art, however, is superb, as the cute character models distract from any technical limitations of the system. The definite highlight of the title, the enhanced soundtrack takes full advantage of the obviously superior DS sound system, while retaining all the melodic beauty of some of Nobuo Uematsu's finest work. The title most clearly shows its age in the basic mechanics of combat and character development, which remain largely unchanged from the 8-bit original. FFIII takes the class system of FFI and upgrades it into the job system, allowing party members to change classes at will, with more options unlocked as the game progresses. While this was probably quite an advancement for the series in 1990, it's a far cry from the vastly more robust system of Final Fantasy V. Aside from some classes being more useless than others, there isn't very much differentiation between them. Fighter classes all revolve around use of the basic "Fight" command, while mages sport the usual assortment of spells. Without any truly notable special abilities to significantly alter the battle dynamic, combat becomes incredibly repetitive. Furthermore, a character's assigned job only really affects immediate stats, rather than determining the course of development. Character-building feels nonexistent as a result, with the party usually composed of just the strongest fighter and mage classes available at the time. On the bright side, there is no grinding for levels a la Dragon Quest. While harder than the average Final Fantasy, the difficulty is due primarily to the absence of in-dungeon save points--another archaism that especially should have been addressed given that it is now a portable game. Story, usually the strength of any Final Fantasy game, is the other major department where FFIII dates itself. While the world is constructed with a cavalier imaginativeness not often found in today's games, and there are occassional moments of genuine awe, the plot is, on the whole, incredibly spare. In an attempt to somewhat modernize the game, the remake replaces the generic party members of the original game with actual characters with names, genders, and personalities. Disappointingly, once introductions are through, however, the initially charming characters say very little. Lacking the involved melodrama that became a series trademark with FFIV, the story just doesn't have much to engage the player. That's probably the main reason that it's taking me so long to get through FFIII. While hardly a bad game, there's just not enough there to make me feel invested, so it often gets set aside as my attention shifts to other titles. With Nintendo having just announced a new model of their DS handheld, I thought I'd take this opportunity to vent some long-held grievances against their last revision, the DS Lite. Quite frankly, it has always been my opinion that the DS Lite is, in most ways, an inferior design compared to the original DS (or "DS phat", as some proud owners affectionately refer to it). While the DS Lite's casing is sleeker and comes in a greater variety of more striking colors compared to the bland options of the DS phat, these aesthetic improvements don't really hold up to scrutiny. At modestly close range, fingerprints really start to stand out against the glossy sheen of the casing, giving it an unavoidably filthy appearance. The shape, while sharper and marginally more portable, is nowhere near as comfortable. I don't even have especially large hands, but the small and rigid design still leads to cramping very quickly. GBA cartridges also no longer fit flush with the outline, instead sticking out obscenely. While the button layout is slightly improved on the DS Lite, the buttons themselves are a step down. The squishy D-pad is far more error-prone, as directions are less-distinctly defined. Likewise, for the face buttons, the springier feel introduces a nebulous zone between press and depress. That may sound like nitpicking, but, on my unit at least, taps on the B button often do not register unless I make a conscious effort to press deeply. While I've considered that this may be a defect unique to my system, the ambiguity of the press/depress states makes it impossible for me to prove that the problem exists at all. It might just be human error, and so I've forced myself to live with this extremely annoying inconsistency. Despite all my displeasure with the DS Lite, I could never go back to the DS phat. The much improved backlight and thicker stylus of the DS Lite are huge advantages that outweigh all my complaints. I just wish there could be one definitive design. Sadly, it doesn't look like my wish will be fulfilled with the new DSi, which adds extra (mostly useless) functionality, but largely retains the flawed design of the DS Lite, while introducing another compromise by ditching Slot-2.